One choice can transform you, or it can destroy you. 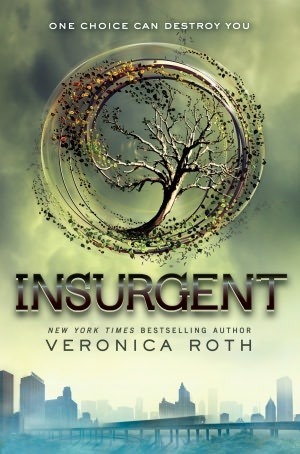 But every choice has consequences, and as unrest surges in the factions all around her, Tris Prior must continue trying to save those she loves along with herself. While grappling with haunting questions of grief and forgiveness, identity and loyalty, politics and love. War now looms as conflict arises between factions. Driven from their once menacing home, Dauntless headquarters, Tris, along with Tobias, Marcus, Caleb and others of the Abnegation faction, take refugee with the Amity. Together, Tris and Tobias struggle with the recent death of their friends and family, while considering the future and their next plan of action against Erudite. Erudite’s battle for power threatens to destroy the entire faction system, the only form of government and society ever known the factions citizens. With knowledge comes responsibility, and Tris and Tobias’s insight to the shady intentions of Erudite leader, Jeanine Matthews, holds them accountable for action. A choice becomes a sacrifice, a sacrifice becomes a loss, a loss becomes a burden, and a burden becomes a battle. As Tris says, “Now there are no reassurances, except that where I go, I go because I choose to. Personally I enjoyed this book and would recommend it to anyone who enjoys science fiction. Well you’ve got to read to the series to understand the books. It is full of suspense just like any other trilogy series and has tons of characters to fall in love with. Tris the main character is my favorite, she is brave and a role model. The way she lives life and takes chances is so heroic. I admire her, she is a great figure to look up too. Overall this book is really good and the series too.